Aquafit is and endurance based workout for all levels of fitness. Geared towards students ages 12 and older. At the Swim Academy our instructor is highly trained with many credentials and years of experience. This program is aimed at improving cardiovascular heath and muscular strength. Getting a full workout without high impact is fantastic for the joints while improving strength and endurance. This program combines simple choreography using tools such as weights, and noodles giving opportunity to increase the intensity on an individual basis. Deep end and Shallow end drills allows students to work at their own abilities and truly make their work out their own. Accessibility: There are wheelchair accessible doors, bathrooms and viewing area however there are only stairs to enter the pool. Change room features: There are showers both open and private, change stalls, change rooms, bathrooms and an area for hairdryers with a large mirror to help you get ready in the morning after your work out. Pool features: The pool is 88 deg. F. Salt water. An excellent environment where it is not too hot to work out in but not too cool that you don’t want to join in those early morning workouts. 45 min class: Perfect for those who are looking for a great work out that increases your heart rate, works on flexibility and strength. 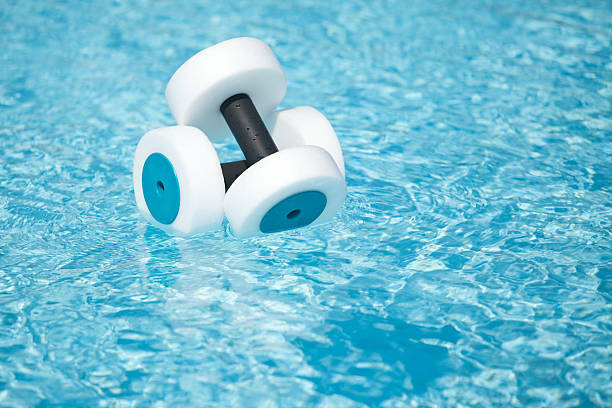 Can be modified to suit your ability and needs with various tools and depth of the pool as well as range of motion. 30 min class: The Power 1/2 Hour. Are you needing a power 1/2 hr lunch break? Come burn your calories in a quick 30 min class.